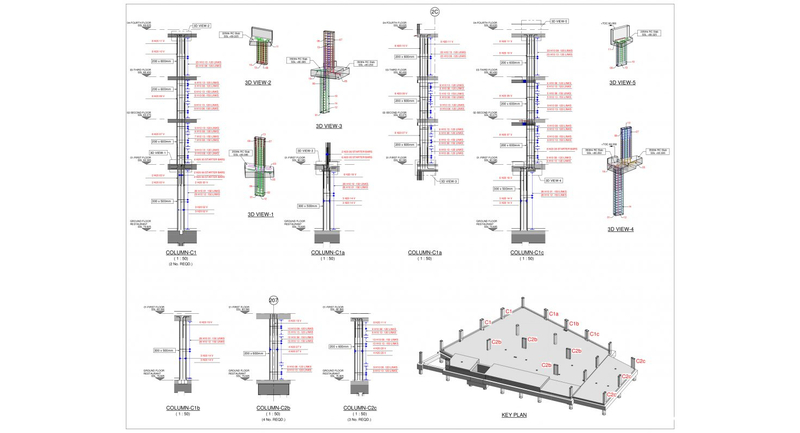 RebarCAD 3D for Revit has been designed to enhance the placement, annotation and bar marking of reinforcing steel in all kinds of RC structures. 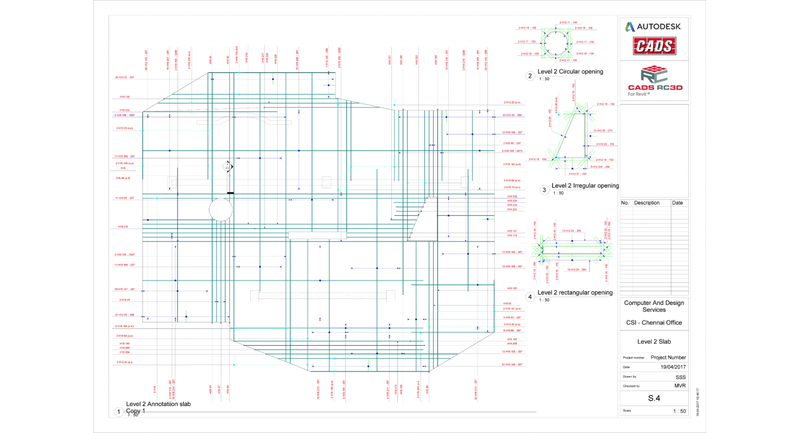 Building on the heritage of our world leading detailing and bar listing software RebarCAD to extend the powerful reinforcement modelling capabilities of Revit. RebarCAD 3D takes the 3D modelling functionality of Revit to the next level allowing rebar to be divided up into particle groups (bar ranges), bar marks to be created and managed, detailed reinforcement (shop) drawings to be created with a single click! Bar bending schedules are automatically created and material lists exported to external production software file formats such as BVBs, aSa, Soulé and Excel. BBS and bar list templates are easy to customise to comply with company standards. There are two options to copy rebar: host to host and along a path. The Host to Host command is used to copy rebar from one identical host to another. The command will accommodate the second host to being at a different rotation than the original. The Along a Path command is used copy rebar along a path. With the reinforcement already detailed and visible use the lap line command to specify the position of splices in the rebar within the concrete host. 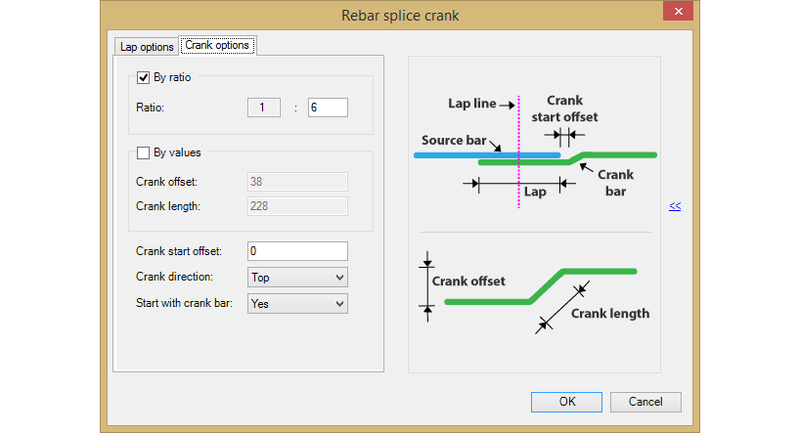 You can use the splice bar command to split modelled rebar into the required stock length. There are two splice commands available: straight lap (laps the bars side by side) and cranked lap (the bars lap top to bottom or vice versa or side by side). 1) The Revit Structural path command always places the rebar perpendicular to the specified path but in most of the practical cases, U-bars need to be placed in the same direction as the main/secondary rebar. RebarCAD 3D removes the orientation limitations from placing U bars and L bars around the edge of walls and slabs. 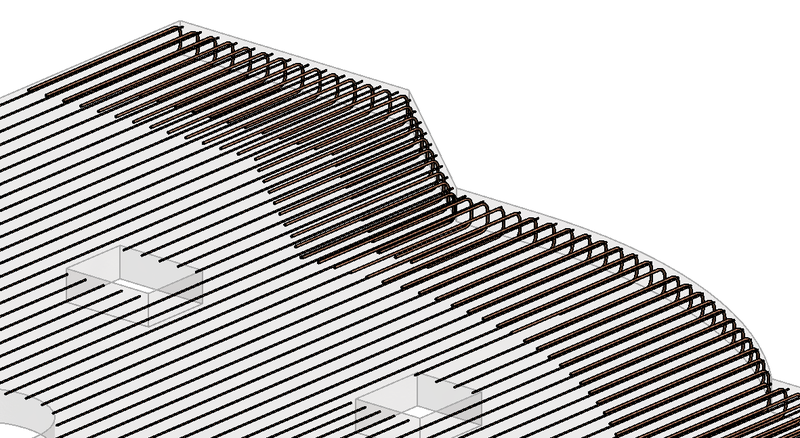 2) The Revit structural path reinforcement does not automatically trim to an acute slab edge. U bar placed using CADS U Placement tool adjusts the rebar length to fit the slab/wall. 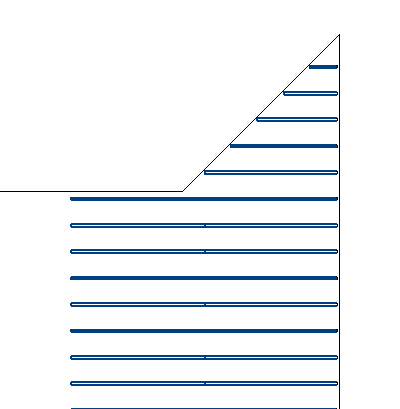 The bars will be drawn until the minimum dimension for the bar diameter and shape is reached. The Open Reinforcement command models the reinforcement around rectangular and circular openings in slabs and walls. The trim and extend rebars commands change their overall rebar length to a selected boundary. The boundary can be a concrete host, a detail or a model line. Two boundaries can be selected to trim the rebar around an opening. There are two commands available: by moving and by trim & extend. Both of these commands will join rebar together to form a new shape. The by moving command will join the rebar together by moving one of the bars selected to connect with the first bar selected. 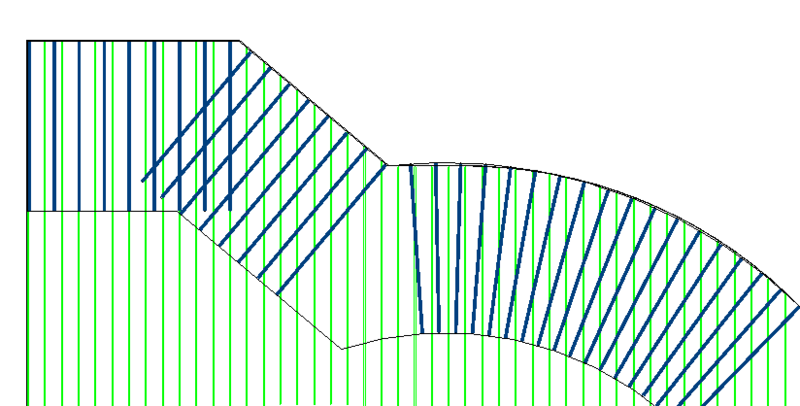 Use the trim & extend command to join rebar together, possibly straight bars where there is a change of angle in the structure but a single shape code would still be suitable. 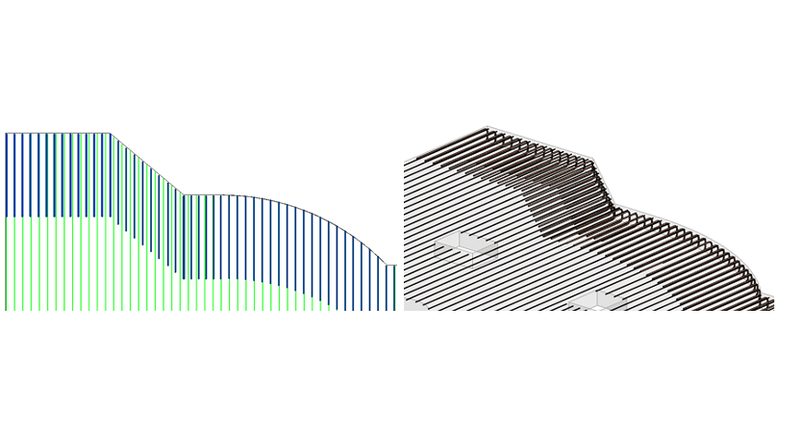 Group rebar together to create additional range styles such as skewed ranges and circular ranges. For instance, rebar placed around a circular shape using the edge bar placement tool will end up being grouped into several bar assemblies. This is caused by the rebar being detailed with very slightly different leg values from the ones defined in the edge bar placement dialog. If we annotated the groups they would show several circular ranges instead of one. The rebar can be ungrouped, the dimensions adjusted and then regrouped. 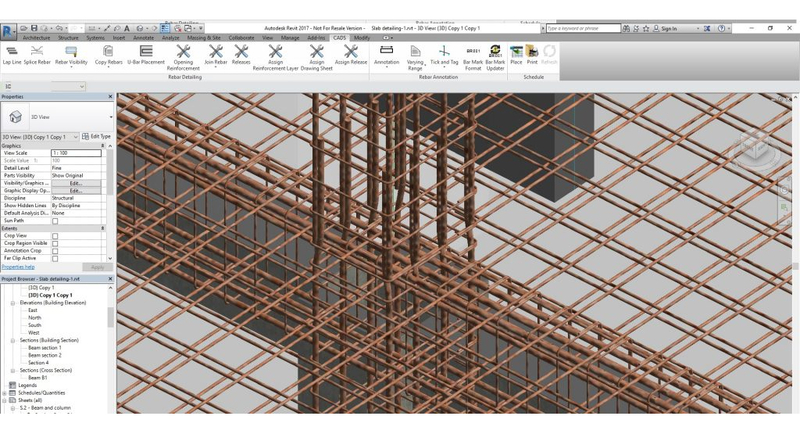 You can create complex range styles by grouping several bar assemblies together once their rebar properties match. 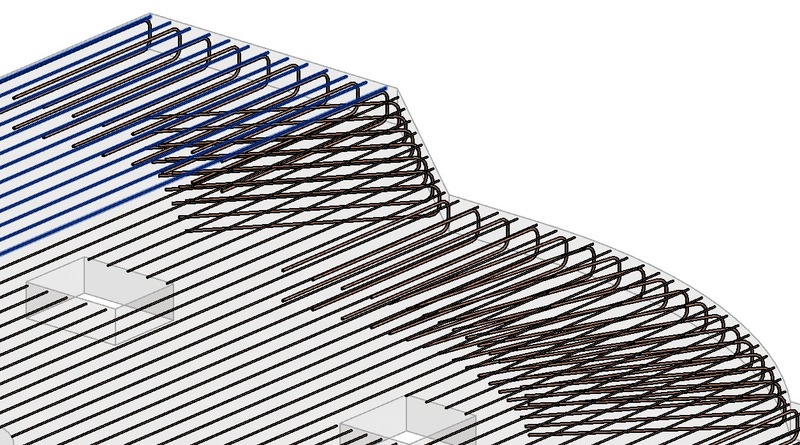 Free form – RebarCAD 3D allows you to change a free form shape created in Revit to an appropriate rebar shape. Split rebar set – In some circumstances, you may need to split a range of bars into smaller segments. You can split an existing range (assembly) of rebars into several segments using the split rebar command. For instance, if applying couplers to join rebar together, the number of bars in each coupled range must be identical. The split rebar set command allows the number of bars to matched in the adjoining rebar sets. 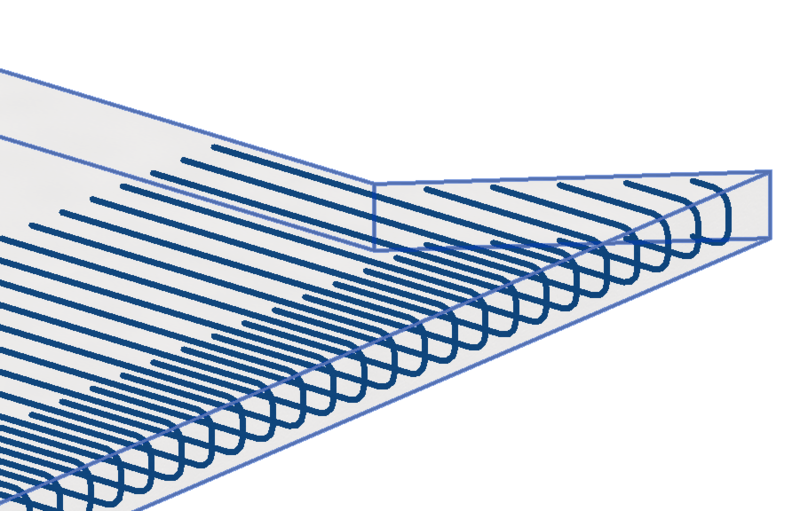 Revit varying set – Revit will convert an assembly of varying rebar created with Revit into individual rebar. 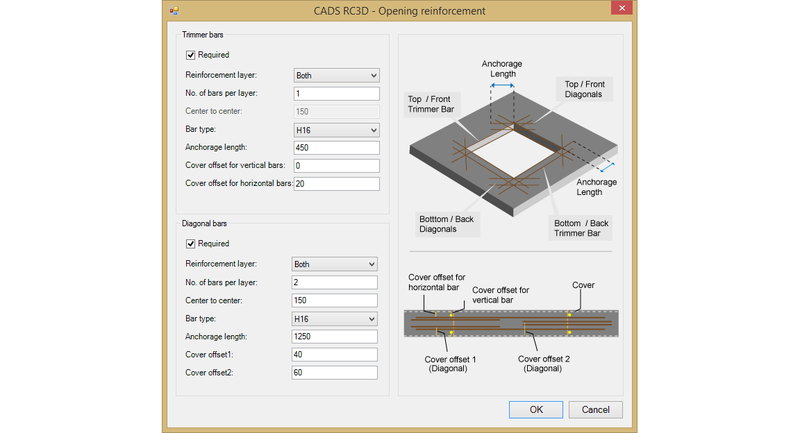 Use RebarCAD 3D to convert the rebars into a varying range. The varying range functions are used to group bars of the same shape, bar grade and bar diameter into one varying bar mark, to apply a step taper to a varying range and to change the visibility of the rebar within the range assembly. 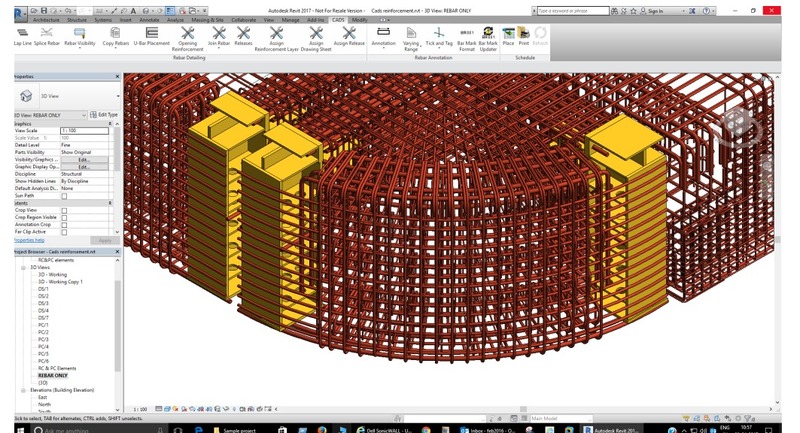 RebarCAD 3D gives control over the visibility of the rebar in each of the views of the structure. It manages the Revit view visibility states using several commands such as hide/show rebar, hide/show all rebar and show rebar by layer. Assign rebar to predefined layers in the structure according to the position in the concrete structure for instance T1 for top major direction, or T2 for top minor direction. The layer names are defined in the Revit Reinforcement Settings dialog. The host mark of the concrete structure is used for the member tile in the schedule. 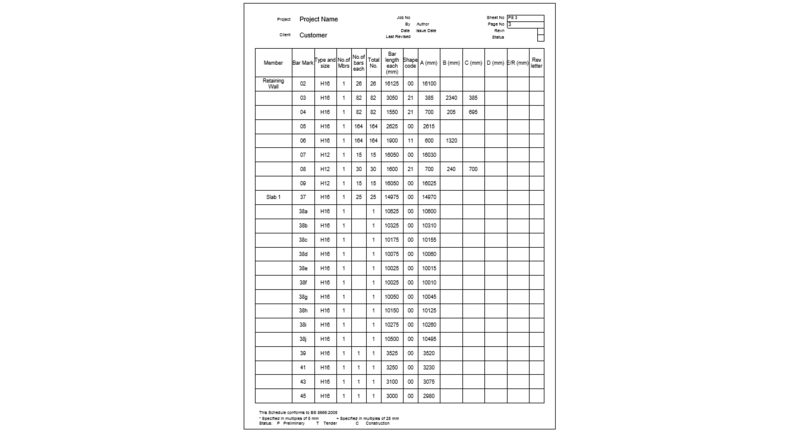 Assign rebar to predefined drawing sheets, schedules can then be printed or placed on drawing according to this designation. 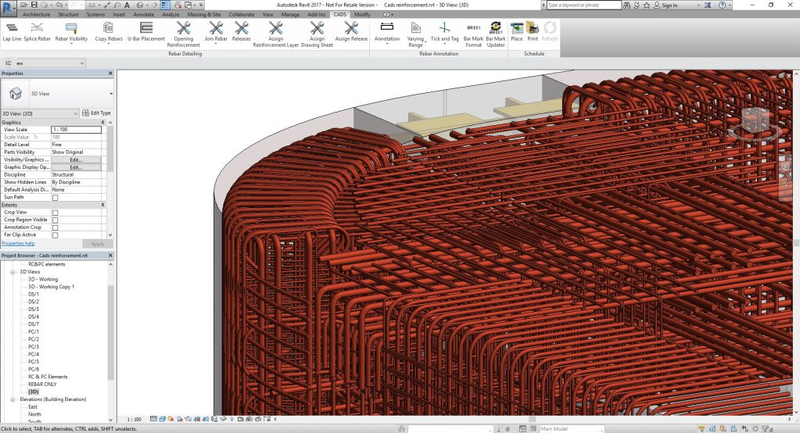 Assign rebar to a predefined release ready to be exported from the drawing for production. Once the rebar is released from the model it is locked to prevent further editing. 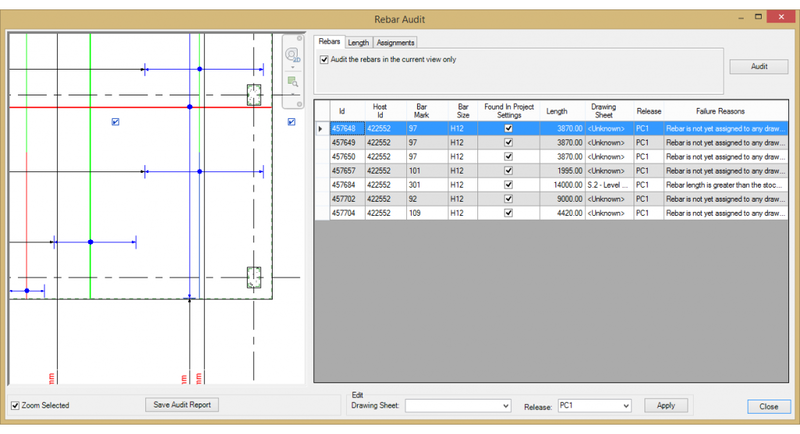 RebarCAD 3D’s audit identifies rebars which are not assigned to a drawing sheet or release. It also identifies rebars that are below the specified minimum bar length or are above the maximum specified stock length. You can identify the rebar for the whole model or just the current view. A report can be saved of the rebar identified to allow their ID numbers to be searched in the model. Change the representation of the rebar assemblies to the standard 2D industry graphical format for the different styles of range. Instead of showing all the bars associated with a range, a single or double indicator bar is shown with a range line, a leader and its associated bar label. If an individual bar is being annotated it will be shown with a leader and a bar label. Use the Annotation command on individual rebar / ranges of rebar, a selection of rebar / ranges of rebar, all the rebar in one or multiple hosts. The tick &tag functionality annotates the end of the rebar with ticks and tags. Options have been added to the functionality to control the position and visibility of the ticks and tags. Annotate bars in section with the rebar reference command. 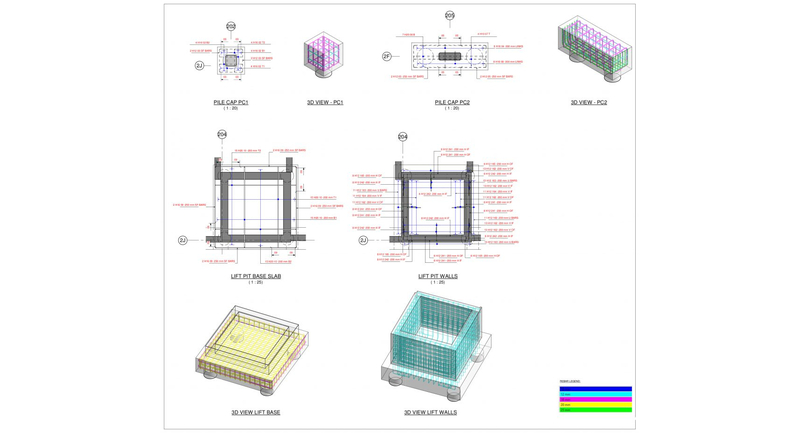 RebarCAD 3D manages the bar marks assigned to each bar set that are displayed on the 2D annotations and in the bar schedule. The bar mark consists of a bar mark number field along with one or more of: partition field, size and the rebar number suffix field of rebar for Revit, varying range and the custom field for CADS varying range. As rebar is added to the model or edited the bar marks change. RabarCAD 3D Bar Mark Updater command indicates when the bars numbers need refreshing. 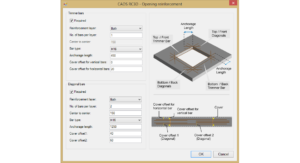 The CADS schedule enables users to customise the appearance and content of the schedule to their own specification, using standard Revit family files. 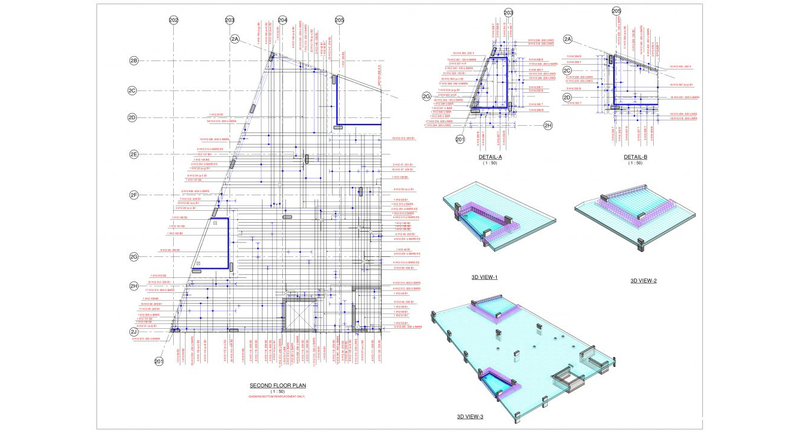 The schedule can be placed on a Revit View Sheet or a set of sheets can be created for printing. 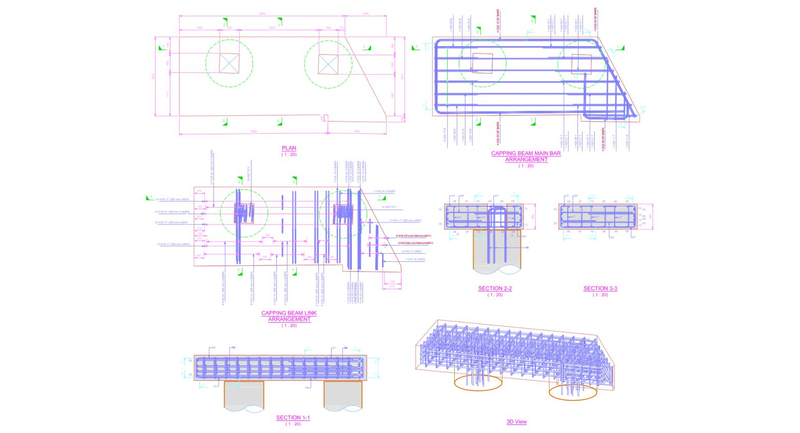 Additionally, a set of rebar shape code sketch diagrams can be placed on the sheet. Create a production output file as a BVBS file. You can also export as an XML file or as a .crs file.